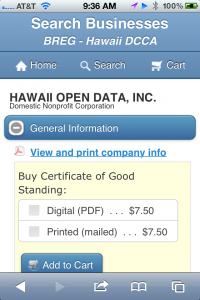 The State of Hawaii Department of Commerce and Consumer Affairs (DCCA) was recently honored with two awards for its suite of mobile business applications. The mobile apps are the first of their kind worldwide and the first mobile apps launched by the state. The International Association of Commercial Administrators (IACA) awarded a prestigious 2012 Merit Award for Outstanding Innovation, one of the top international honors for business registries, to DCCA’s Business Registration Division (BREG) last month at the IACA annual conference. BREG has repeatedly won awards for online innovation over the years. This most recent IACA award is the third for BREG since 2007. Recently, DCCA’s BREG mobile apps were also awarded Best Government Mobile Website in the inaugural MobileWebAwards competition, held by the Web Marketing Association. The apps are modified versions of services available on the Business Registration website, including business name searches, document purchases and annual filings. 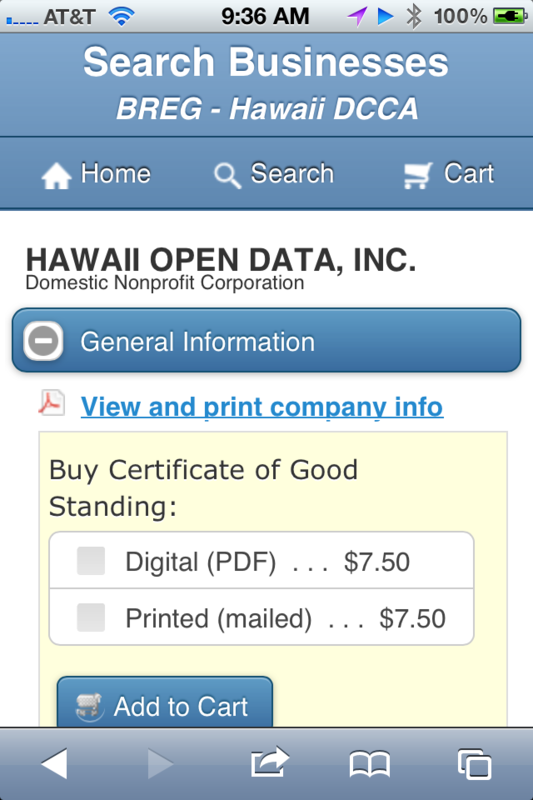 To access the mobile apps, go to business.ehawaii.gov on any mobile device or tablet and the site will default to the mobile apps. The new mobile apps optimize touch screen technology and smart phone interfaces by providing larger text, buttons designed for touch response and custom layouts for smaller screens. With more than 120,000 annual reports filed by businesses in Hawaii and over 6.5 million unique name hits for the business name search service, the new apps provide speed and efficiency that should help users find business information and keep their businesses in good standing throughout the year. The mobile apps are part of the Abercrombie administration’s New Day initiatives as set forth by the Office of Information Management Technology (OIMT). They were developed through the eHawaii.gov program, a largely self-funded public-private partnership between the State of Hawaii and Hawaii Information Consortium LLC, a Hawaii corporation and wholly owned subsidiary of eGovernment firm NIC Inc. It is time you named the people who developed the computer take on business competance, like my son, Robyn Blaber and others.